The year is 2010; the setting, a cold and gloomy playroom in Western Canada. Fingers of pale sunlight angle through the wooden blinds and rest, as if exhausted by the journey, on a train table. Their presence does little to cheer the room or allay its wintry chill. Magnetic trains huddle together, lips pressed shut, shivering not with cold, but fear. The mountain winds whistle through the trees like harbingers of the terror that lies in store. As the voices of children echo off the bare walls of their nursery, no one notices a small figure crouched in a dim corner — or the faint shredding noise — until it is too late. Minutes later, in the same corner, a scream pierces the air. A broken shell of a book has been discovered, pages rent from binding. The Ripper has struck again. This ghoulish mutilator of literary gems has been the scourge of the playroom for a few months now. He preys on its quietest denizens. Although he is well-read, mercy and remorse are not in his vocabulary. The Ripper’s first victim was, at one time, believed to have been a beloved copy of “Busy Little Mouse,” whose back was brutally broken and torn to small shreds one day in early December. But after some investigation by the intrepid Inspector Mom, it became apparent that a serial mutilator was on the loose. Criminologists say to catch a serial criminal, one must look to his first crime. The 2009 mutilation of “Where Is Baby’s Mommy?” — if that, indeed, was the original crime — would suggest that our Ripper is either a baby, or a mama’s boy, or both. Some in the house (Sherlock Mads, for instance) have suggested that Inspector Mom herself has, in fact, caught the ripper in the act and let him go with a mere warning — and that The Ripper is her own son, Thomas Phillips, a known frequenter of the very bookshelf that so many of The Ripper’s victims called home. The case against Thomas is strong. When the sound of tearing paper rends the winter air, Thomas is often found cradling the latest mangled victim of The Ripper. And the victims are often “his type” — small, colorful board books with a lift-the-flap feature that toddlers find impossible to resist. What we do know is that, for now, no book is safe. “Chicka-Chicka-Boom-Boom” and friends have sought safety on a high shelf. The Karen Katz Lift-The-Flap collection is in protective custody. The watchful eye of Inspector Mom looks over “The Greedy Python” and “Slowly, Slowly, Slowly Said the Sloth.” It is a dark and forbidding time for nursery literature here. There is faint hope that The Ripper will pay for his crimes, but many here fear that the corrupt, complacent authorities will simply wait it out, assuming his lust for paper will one day abate and books will again be able to lie about the room, unshadowed by the spectre of disarticulation. For now, “Sadie the Ballerina” hides, motionless. “Curious George” dares not peer from his perch. Optimism is as dim as the wan February sunlight in this bleakest of Canadian playrooms. Wary eyes survey the floor constantly, hoping that today will not bring the discovery of The Ripper’s latest crime. Those who spend their days in this nursery jump at the merest turn of a page. Perhaps, as spring turns and days are spent watching yellow rays dance on warm, bright grass, summer’s optimism will overtake the dark mood here. But until then, in this interminable season of terror, the shrieking of bitter winds portends but more grim deeds at the hand of The Ripper. Thomas: Innocent book lover, or scourge of the family library? The first thing you’ll read in any book or article on potty training is this: Kids potty-train on their own time. Let them pick the pace. Of course, another pellet of wisdom from the potty experts is that children need to be physically capable of removing their pants, which is why Thomas — to his undying chagrin — is not being potty trained yet. You see, Thomas is very pro-potty. Anytime James happens to be sitting on his little blue Baby Bjorn potty chair , Thomas squeals with glee and places the training seat on the big potty and shrieks at me until I deposit him atop his throne, to a chorus of triumphant cackling. In the event that he is not placed on the potty while James is trying for No. 2, Thomas will angrily drop a deuce in his diaper right then and there. While Thomas’ goal is to use the toilet like a big kid, James’ goal is to transcend the excretory system altogether. Oh, sure, he is happy to put something in the potty if there’s a treat on the line. But James has far greater ambitions. And with that goal in mind, he stayed dry all last night, for the first time ever. “Would you like to pee in the potty, James?” I asked after retrieving him from his room. After a two-juice breakfast, I asked him to sit on the potty again. All right, then. Of course, it’s no easy task steeling oneself against bowel and bladder evacuation when one’s attention is divided between holding in a night’s worth of pee and playing with toy excavators. “NO! I stay DRY!” he insisted, Pull-Ups drooping heavily with evidence to the contrary. As I cleaned him up, I could hear Thomas banging on the door and squealing with anger at my failure to include him in the festivities. Once James was ensconced on his wee throne, I opened the door to an overwhelming statement by Thomas, in olfactory form, that one can indeed attain yogi-like control over one’s bodily functions. In a world in which Thomas was not one of three spirited children, I might consider toilet-training a baby who was neither able to remove his pants nor climb onto his potty of preference (yes, the Baby Bjorn is great for putting toys in and all, but nothing beats a giant, flushable potty into which you can fit your entire body if you so desire). But there are other kids in this family. Ones who are likely to start jumping off tables or get into the glitter glue if I disappear into the bathroom to keep the baby from drowning himself in the loo. So until the summer, when Thomas has reached the 18-month mark and isn’t swathed in heavy winter clothing, we’re just going to have to put up with on-demand pooping synchrony. I think they’re on to me. For years, I’ve been telling my children that I can see through walls and can monitor everything they do. It started with an offhand comment about needing laser eye surgery. “Do you have laser eyes, Mommy?” asked my then-2-year-old daughter. wide-eyed. “Yes, Maddux. That is how I know when you’re being naughty, even when I can’t see you,” I replied. 7:30 Kids are tucked in. 8:15 Loud thumps, naughty laughter and the squeaky melodies of hard-partying My Little Ponies waft downstairs from Maddux’ room. 8:16 I find Maddux sitting straight up in her bed, My Little Ponies in each hand, eyes shut as if in slumber but fluttering ever so slightly so that she can peek and see whether I’m on to her. 7:22 More thumping and giggling are heard upstairs. Here’s another scenario for you. I come downstairs into the playroom with the boys after naptime and notice Maddux lying underneath the table. It’s not a very low table and offers absolutely zero shelter if you’re looking for a good hiding spot. Since there’s an obvious lack of glowing red beams shooting from my face, I figured at some point Maddux would figure out that her mom hasn’t been bionically augmented. But as Maddux’ intelligence and knowledge base have increased, her level of incredulity has stayed at zero. Although I could have told her laser eyes were a recessive trait and that she couldn’t expect to see through walls and set things ablaze with a mere glare unless Daddy had a dormant laser-eye gene, I instead told her that she would get her laser eyes when she became a mommy. It’s kind of true. Especially if she gets my nearsighted genes. Then James threw his head back and began laughing uproariously. Because, of course, he knows that my supposed laser eyes are a fraud of Madoffian proportions. 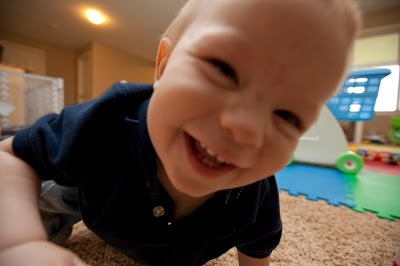 I suppose I should be proud of my son for having the earliest-developed sense of sarcasm in the history of humor. But really, I’m just scared. Once they figure out that my laser eyes are actually just a pair of working ears and some intuition, the jig is up. At least until I convince Santa to give me access to his network of hidden cameras. When I look back on my childhood, my memories are broken up into two distinct eras — preliterate and literate. What I remember most about my preliterate life was wanting to read. Learning to read was like discovering the master key to the mysteries of the universe. No longer at the mercy of my parents (who were no doubt as relieved as I that they were no longer my personal encyclopedias), I was an insatiable consumer of fiction, biography, science textbooks, poems, magazines, newspapers, and the entire AMA Family Medical Guide (or as I liked to call it, the hypochondriac manual). Learning to write went hand in hand with learning to read. I used words to label my pretend anatomy charts at age 5, to poke lighthearted fun at Reader’s Digest in junior high with my “Melodrama in Real Life” series and, later, to earn an impressive $10 an hour as a rookie newspaper reporter (age being no indicator of wisdom, this was what I chose to do with my expensive 4-year private-university education). Having had this 28-year love affair with the written word, I’ve been anticipating the day my own children could share the joy of reading. When I held a 6-week-old Maddux in my lap and opened the pages of “Busy Little Mouse” for the first time, I imagined a time when she’d enjoy books on her own. While she teethed on her well-worn copy “I Love My Mommy” at 10 months, I told myself she was merely practicing for her future as a voracious reader. But as much as she is her mother’s daughter in many ways (how many preschoolers can accurately summarize the workings of the circulatory, respiratory and digestive systems? ), she also is her own person. And that person would rather be read a story than to read one, and would rather “just figure it out” than look it up in a book. Of late, she’s been sounding things out and connecting the sounds the letters make with the noises she hears in words. With a little prompting, she can finally read some of the easier words in her picture books. And tonight, in the bathtub, something finally clicked. “Jjjuh. Ayy…” she began, using the word-building techniques her school and I have been using. “So, what letter makes that sound?” I prompted. “A!” Maddux squeaked excitedly, fishing around in the bubbles for that vowel. 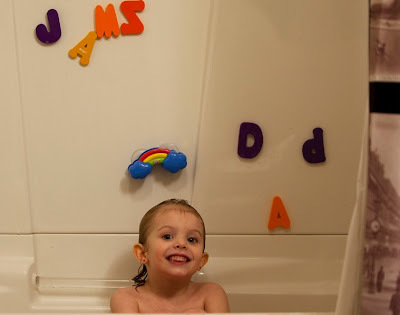 She sounded out “Mmm” and followed it with “Zzz,” and thus was her first-ever word spelled on the wall of our bathtub. Technically, “Jamz” is not a word or a name, but it’s an appropriate phonetic spelling of “James,” so we’re counting it. She then spelled “Dad” with ease. I have no idea what Maddux plans to do with her new skill — whether she’ll instantly begin devouring material way above grade level, or whether she plans on reading only when she can’t find someone to do it for her. Part of me suspects that she began reading because James has begun trying to sound out letters recently and Mads didn’t want her baby brother catching up with her. But no matter what she does with it, Maddux’ future is here. She’s got the key to the entire world — literacy — right within her grasp. Soon she’ll be able to read herself stories, to select her own videos in Media Center, and even to discover that restaurant menus contain more options than just the healthy ones Mommy and Daddy offer up as suggestions (thank goodness ‘chocolate’ is such a long word). Learning to read may not be such a huge milestone in everyone else’s lives, but it was the big milestone in my childhood. Books were my entertainment and my primary source of information in a pre-Internet world. The public library was an adventure, and at the same time, a home away from home. I hope literacy will be important to my little girl as well. I look forward to sharing the old childhood classics, along with all the new books we find in the Scholastic catalogs she brings home from preschool. At the very least, I am excited — as I’m sure my parents were when I was small — at the prospect of no longer serving as my daughter’s on-demand encyclopedia. So proud of her work, she insisted on a picture!